Marlboro Greens, an active adult community in Marlboro NJ. 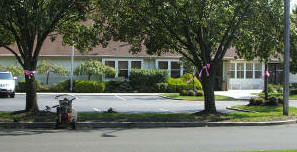 Marlboro Greens is an Active (55+) Adult Community in Marlboro, Monmouth County, NJ. Located on Route 9 near Union Hill Rd, it was built between 1986 and 1988. There are 341 homes in Marlboro Greens, with 6 different models: Furthermore, all homes are attached. As a result, the association is responsible for the exterior maintenance.The homes have either two or three bedrooms. Additionally, some homes include a garage. Ashborne I – 2 bedrooms, 1 bath, lower level, however, this model doesn’t have a garage. The community has an active clubhouse, which includes activities like swimming pool, tennis and more. However, Marlboro Greens doesn’t have a golf course. So, if you want to golf, Monmouth County has numerous golf courses. All Adult Communities in Monmouth County offer transportation services to any medical facility or doctor’s office in Monmouth County. Also, a return trip is included. You must schedule these trips a few days in advance,however there is a small charge for this service.The county also provides a free bus service from each community to local shopping centers, malls and supermarkets. Commuters love Marlboro Greens because bus service from New Jersey Transit is within walking distance on Route 9. However, if you prefer riding the train, it’s available in Matawan. Thank you for helping us find our new home. You were so patient with us, listening to what we wanted in our new home. Then you went and found exactly what we were looking for. We have a friend who is looking to move to the area, and we have given her your number.